(P1) Considered by most AFICIONADOS to be the PINNACLE of the industry, SINGLE MALTS are WHISKIES made from a single DISTILLERY. (P2) They typically command a PREMIUM PRICE over BLENDED WHISKIES. 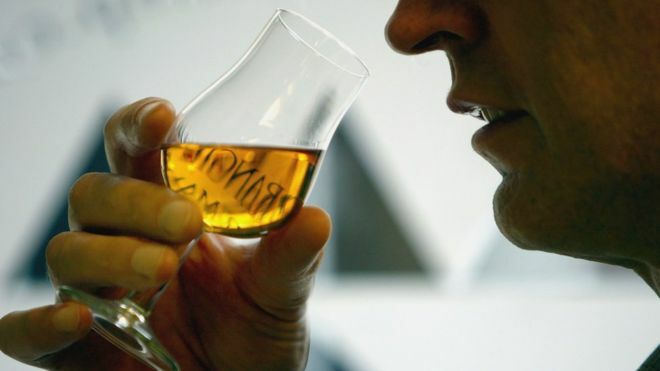 (P3) Whisky consultant Jim Swan says selling a popular single malt can be “very profitable”. (P4) “A single malt whisky [from an independent distillery] might cost £45, with a profit of £15 per bottle,” he says. (P6) Meanwhile the industry is continuing to boom – exports alone of single malt whiskies in the first half of 2015 totalled £406m, a rise of 5%, according to the Scotch Whisky Association. (P7) But creating a new whisky business is not for the FAINT-HEARTED, or the cash-poor. (P8) It requires millions of pounds in UPFRONT investment, but it can take three to ten years to have whisky ready for sale and to see any profit. (P10) He estimates £250,000 per year is needed to keep a small distillery operating, and it is likely to be eight years before a whisky business BREAKS EVEN. (P11) Despite this, the number of distilleries in Scotland, the world’s largest producer of single malt whisky, is growing. There are currently 117, up from 100 a couple of years ago, and 30 of these are small independents. (P12) The time it takes to get your product to market can create major challenges, as 38-year-old Kingsbarns Distillery founder Douglas Clement found out. (P13) He worked as a CADDY at St Andrews golf course for 20 years, and decided to start a whisky distillery after visiting golfers repeatedly expressed frustration at the lack of a nearby distillery. Mr Clement raised initial funds for Kingsbarns by approaching his golf clients, but was rejected by many VENTURE CAPITALISTS. (P14) “Most investors want a profit in three to five years. The trouble with whisky is that they won’t see much money for about 10 years,” explains Mr Clement. (P15) The TURNING POINT came in 2012 when he SECURED a £670,000 GRANT from the Scottish Government. That convinced one of the oldest distilling families in Scotland, the Wemysses, to invest £2.5 to £3m. (P16) Mr Clement sold his interest to them, and he is now employed as the manager and is credited as the founding director, an arrangement he says he’s “extremely happy” with. (P17) “This project for me personally was never about profit. It was about taking my idea for a whisky distillery and turning it into a reality,” he says. (P18) It will be summer 2018 before the first release of Kingsbarns single malt whisky. In the meantime, they are finding other ways to make money, such as the income from their visitor centre, shop, and cafe. Do you have a dream for your own business? Would you have the PATIENCE to wait three to ten years for a profit? In order to realize his dream of starting a whisky distillery, Douglas Clement had to sell his ownership of the business. He says he is “extremely happy,” but do you think he was actually frustrated?